Greeted with fine weather, we all made the most of it. 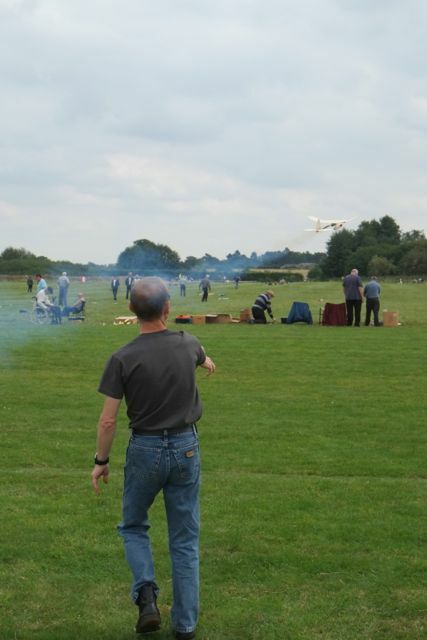 Lot's of R/C assist Tomboys, lots of noisy control liners in fact lots of diesel free-flighters also. Don't get me wrong, there was also plenty rubber, Rapier and jetex examples too. On the Saturday Roger pitched up in a wheelchair and hopefully enjoyed the action. It also gave me a chance to wring out the CAP, an L1 powered duration kit from the Czech Republic. A few tentative low sorties meant reducing the nose weight then off into the wild blue yonder. 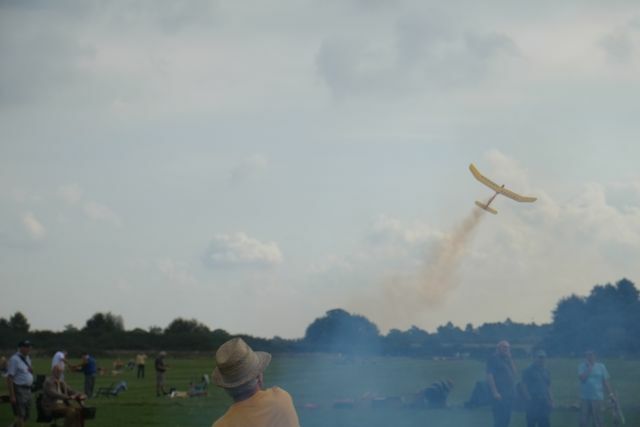 In fact when a westerly breeze sprang up I launched into lift and got a 5 minute flight out of the aerodrome, I was fortunate to find it. I also trimmed out Roger's Alpha jet and Mig 19 then it was time to quit. Sunday was more of the same weather wise but a tad more draughty. There were lot's of highlights, like trying to get a flight out of the Mike Stuart Jetex Skyray tailored version. Ultimately unsuccessful but well worth the try. It needs a Graham Potter style lighter and a catapult launch me thinks. 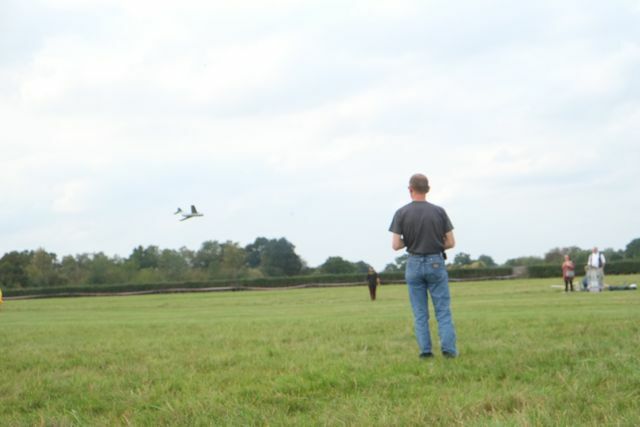 Also in attendance was the father of all jetex enthusiasts Dr John Emmett flying a nifty looking Viper with 50c. 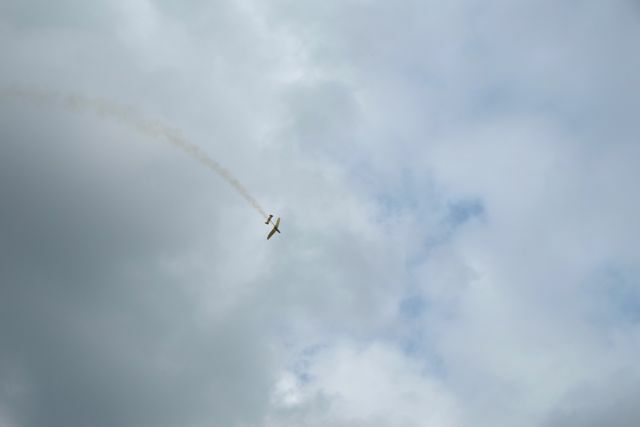 Joy of the day was Peter Illife's Rumpler doing it's stuff over our heads. There was also Ron Johnson's whopper Skyray and Viggen doing the ducted fan thing. John took some pictures which he kindly sent me. 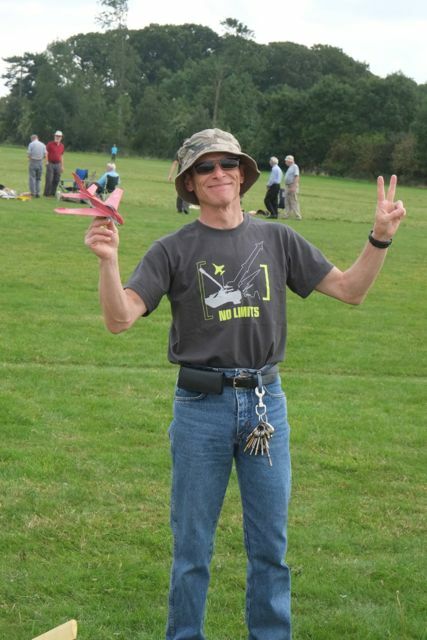 In them you will see the hat and Yellow shirt of Chris Richards who was as always a great friend to have on the flying field.